DES MOINES - Iowa Barnstormers Head Coach and Director of Football Operations Mike Hohensee announced today that offensive lineman Michael Garrity has been assigned to the Arena Football League franchise for his third consecutive season. Garrity (6-6, 295, Eastern Illinois) enters his third season in the Arena Football League as an Iowa Barnstormer. Garrity first joined the franchise in 2012 after spending time at the Chicago Bears rookie camp. 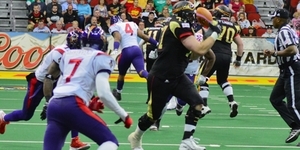 An injury his first-ever Barnstormers game forced him to sit out the remainder of the season. In 2013, Garrity was featured in five starting lineups while playing in a total of six games. "I know Mike has been working hard to prepare for this season," said Coach Hohensee. "We are counting on him to be one of the cornerstones of a dominant line." Prior to his professional football debut, Garrity transferred to Eastern Illinois University for a two-year tenure after transferring from Illinois. Season tickets are on sale now for the Barnstormers 2014 season for as little as $110 per seat. Season tickets make a great gift for the football fan in your family. Don't miss am inute of the action! To order your seats or for more information, please call the Barnstormers at (515) 633-2255 or log on to www.theiowabarnstormers.com.